Are you looking for more ways to incorporate digital resources into your classroom instruction? Boom CardsTM are interactive, digital task cards that can help fill this need. Boom LearningSM is a growing site with new options being developed and added on a regular basis. I have barely dipped my toes in and am excited about all the possibilities! There are membership options that allow you to purchase decks, create private decks just for your class, or create decks to sell. You can find free sets on the Boom Learning site or on Teachers Pay Teachers (hosted on the separate Boom Learning site) to try with your students. 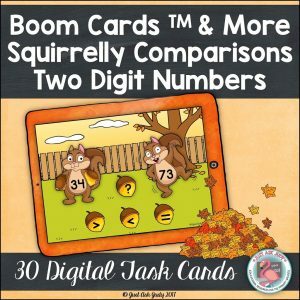 You will find many of the Boom Cards digital task card products on TpT also include printable resources giving you flexible instructional options. Boom Cards can be used for instruction with a whole class or small group. They can also be used independently by students as a center, station, or early finisher activity. I have crafted a free kindergarten and first-grade phonological awareness resource for counting one, two, and three syllables. 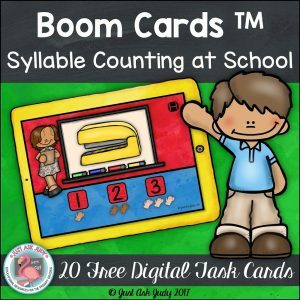 The main component of this school themed resource is a deck of 20 digital task cards hosted on the Boom Learning platform. Syllable Counting at School, available in my Teachers Pay Teachers store, also includes an optional recording sheet which can be used with the digital task cards, two Cup Craze mats, in color and black/ gray/ white, along with a recording sheet in two formats, mark the number and write the number. I added numbered circles, which can be printed and cut, to use if you prefer instead of cups. The Cup Craze activity is ideal for individual or small group use. To use, choose color or black/ gray/ white. Print your mats on card stock and laminate for durability. 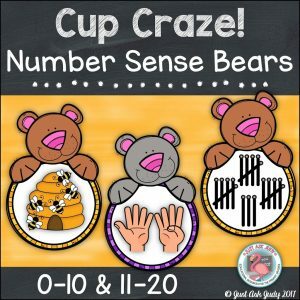 Print, laminate, and cut the numbered circles, one set per participant, if using in place of cups. Print an optional recording sheet and any answer keys you are using. You will need to provide a set of cups, plastic or paper with a two to three-ounce capacity, with a round bottom that can be written on for each participant. Turn the cups bottom up and use a super permanent marker to write the numbers 1, 2, and 3 three times each. One cup will be leftover. Give each student a mat and a set of cups. They simply name the picture, count the syllables, and match a numbered cup (or circle) to the picture. They can mark or record their numbers on an optional recording sheet, on plain paper, or on a whiteboard. 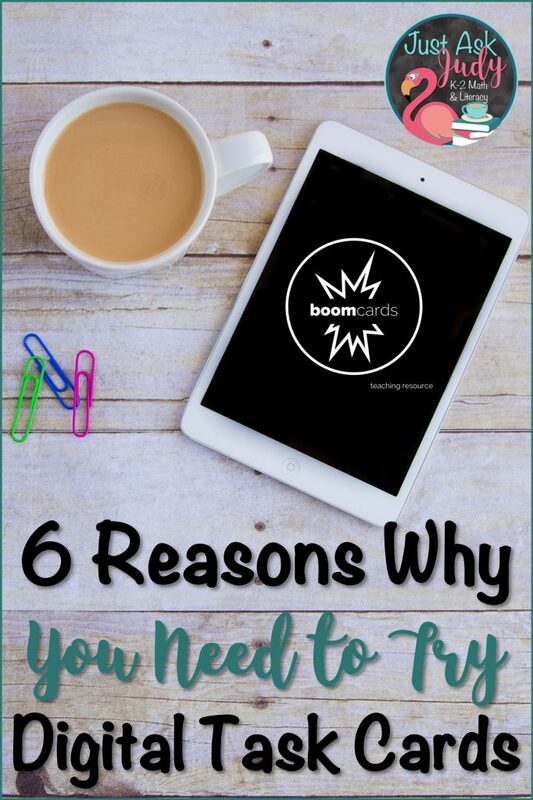 Be sure to give Boom Cards digital task cards a whirl in your classroom! Mrs. Renz’ Class has a wonderful tutorial to get you started. I’d love to hear how you balance digital learning with hands-on and paper/ pencil instruction in your classroom. Stop by my store and check out what else is new!